Serving the West for over 65 years. BH Tank was founded during an era in America when manufacturers built products to last a lifetime. We still do. 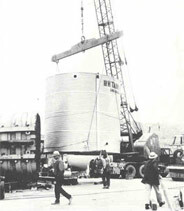 Our specialty back then was high quality, hand crafted water storage tanks. That's still our specialty. Over the past 65 years, we have gained a great deal of knowledge about water storage - and have applied that experience and expanded our capabilities to provide a variety of liquid storage solutions. And our customers benefit from that experience. The combination of dependable service and skilled craftsmanship quality has created thousands of satisfied BH Tank customers all across the West. And that's the way we still do business. Quality products, and the qualifications to back them up. BH Tank backs every tank built and sold with a strong factory warranty. But equally important is the over 65 years invested in our reputation. We're keenly aware how vital your satisfaction is to our continued success. So, whatever you need, from design consultation and engineering to tank fabrication and installation, BH Tank can handle it.